In Brazil, harvesting is advancing for the spring-planted crop and average yields are expected. Sowing of the summer- planted crop (higher producing season) is progressing under favourable conditions. A slight increase in total sown area is expected. In Argentina, harvest of the spring-planted crop has begun under exceptional conditions in the main producing areas. Conditions are favourable for the summer- planted crops. In Mexico, conditions are favourable for both the spring-summer cycle and autumn-winter crops. In South Africa, conditions are mixed as dry conditions in the western production area early in the season reduced sown area, and current warm and dry conditions continue to put pressure on yields. Rainfall over the short term will be crucial to determining final yields. In India, conditions are favourable for the Rabi crop as sowing is complete and total sown area is close to average. 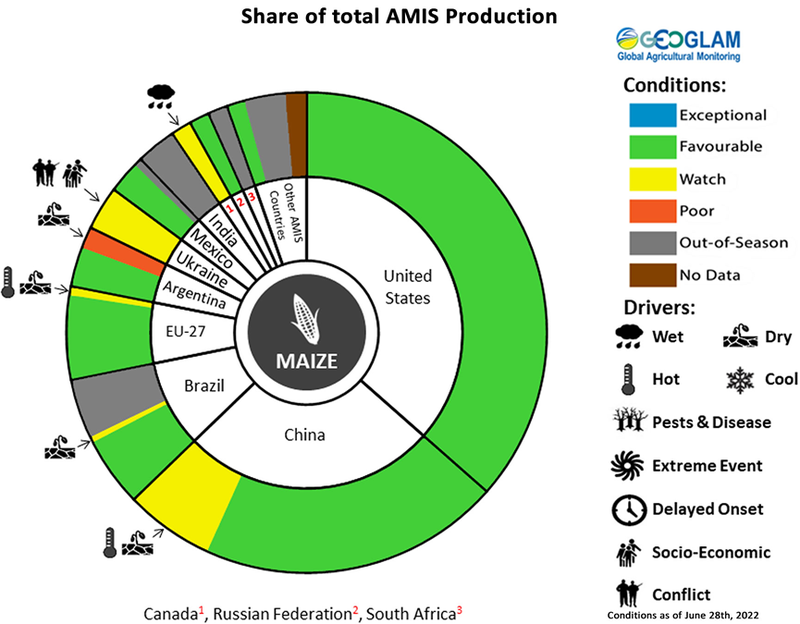 In the US, sowing of maize has begun in the southern states under favourable conditions.